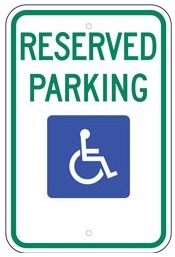 R7-8 RESERVED PARKING (Handicap symbol) with Arrow options: None, Right, Left or Double. (Standard Reflective on .080 gauge aluminum). Most widely used handicap sign in the U.S.